Fashion In The Forest: Pop Up Some Goodness - With Dean & Thomas Popcorn! Pop Up Some Goodness - With Dean & Thomas Popcorn! When sitting at home, watching a movie, you need something to snack on. People like things that aren't complicated, things they can grab and pop in their mouth - things to enjoy while keeping focused on the movie. At Dale & Thomas Popcorn, they understand that. They make popcorn for the snacker. They sent me the Spooktacular Halloween Gift Box to review. It didn't last long. Why, you ask? Because everything in it was really, really delicious! 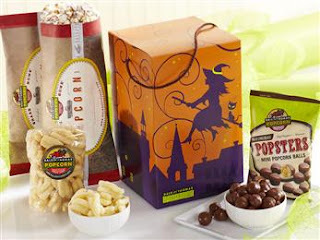 The Dale & Thomas Popcorn Spooktacular Halloween Gift Box is sure to bewtich all of your Halloween goblins! Filled with two footlong bags of gourmet popcorn (Twice-As-Nice Chocolate Drizzlecorn and Hall of Fame Kettle Corn), Parmesan & Garlic Cheese Sticks and Milk Chocolate Popsters (freshly popped caramel corn dipped in rich milk chocolate), this decorated gift box is an affordable way to send big Halloween greetings. Each bag of popcorn is one foot long and serves 2-3 people. All of their popcorn is gluten free and kosher OU-D.
My favorite thing was the Hall Of Fame Kettle Corn, simply because I completely adore kettle corn. It's the perfect mix of salty & sweet.....but believe me, each item was completely delicious! With the Garlic Cheese Sticks offering a tangy alternative to your sweet treats, there's a little bit for everyone in this cute Halloween box. The Milk Chocolate Popsters were like candy store confection while the Twice As Nice Popcorn was an all around crowd pleaser! Whether you're looking for traditional popcorn like butter or cheese flavor, or something sweet & satisfying like cinnamon creme or dark fudge with praline almonds....or off the wall & daring like wasabi or bacon ranch - Dale & Thomas Popcorn has you covered!